For those without comedic tastes, the so-called experts at Wikipedia have an article very remotely related to Artie The Strongest Man in the World. 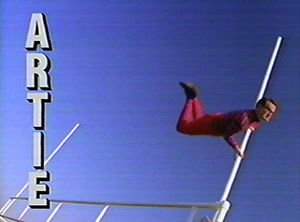 Artie The Strongest Man in The World was born in 1966 in a port-o-potty outside of Wellsville, New Jersey, USA. No one knows how he was raised or how he achieved his powers, but there is no question that he is indeed the strongest man... in the world! Artie is seen hanging around Wellsville most of the time. He spends his days fending off killer bees and maniac schnauzers, spazzing out to the song "Love Rollercoaster", and hanging out with his best friend and little viking, little Pete Wrigley. Artie loves the sound of armpit farts. It reminds him of his mother. Chuck Norris once tried to battle Artie, but the fight ended in a draw. If Chuck Norris and Artie ever teamed up to fight evil, their chances of winning would be 200%. This page was last edited on 14 March 2018, at 03:56.